Why those listing could be sold much more expensive than listing price? Common tactic for realtors to underprice listings in an attempt to start a bidding war. Over list doesn't necessarily mean the property sold for more than it would have if it was listed at a higher price to start. Ronk can you provide the addresses for those listings? It would be good to check out the assessed value of those homes. 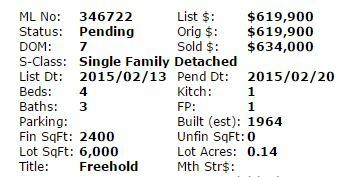 Wow, the Carnegie home was assessed at $500k and sold for a $130k more. I've seen this happen for a few years here in Gordon Head--bidding wars, sales completed hours after listings. It's amazing. In a way I hate to see it because I think it would be better for all concerned if prices cooled down. But it's understandable--GH is a desirable neighbourhood. Well designed houses with huge basements suitable for suiting out and massive lots that are literally twice the size of something you'd find in new Westshore developments. Carnegie is a really good location, too..just up the street from a park, 5 minutes walk to GH Rec centre one way, and 5 mins the other to all of the shops at Shelb/Mack..
Who's buying these homes at those prices, though? I've started seeing more and more rooming houses appear in GH with absentee landlords running the show from afar (and letting their tenants run wild). On a friends cul-de-sac/dead-end street several homes have ended up as such and what was once a quiet residential community where everyone knew their neighbour is anything but. In fact now they think there's even a drug dealer in the fray due to cars coming and going to/from one of the houses. And I've been to several homes rented out like this, some pretty swanky ones, too. So I dunno, based on what I've seen and what acquaintances tell me Gordon Head ain't what it used to be. Gordon Head has a Chinese population of 28% (source: zoocasa) versus other areas which are below 5% like Oak Bay (source: zoocasa). A theory I have heard is a lot of Chinese buyers hold cash in US funds; therefore, with the drop in our Canadian dollar Victoria and Vancouver have become much more attractive. Of the last 10 sales reported in Gordon Head I can see two buyers are of Chinese passport (non-cnd citizens). I know it doesn't seem like a lot but you just don't see that in other areas. Do you think foreign buyers are just throwing money at whatever home fits their investment strategy, i.e. offering $30k more than asking at well over $100k above assessed value? Are there actual bidding wars between these guys? I should note this is isolated to Gordon Head....you don't see non-cnd buyers in Langford or Sooke in any great extent, for example. Edited by MarkoJ, 09 March 2015 - 08:25 AM. Every like group clusters. Will be very interesting to see where this goes and if its a trend. When I was in university I went to many keg parties in rooming houses in Gordon Head so this is not new. It might be new to your friend's street but this has been going on for a long time. The difference today is the homes are owned by absentee (non local) landlords with foreign kids as tenants. Different scenario from the one I remember during my days at Uvic. Have not noticed any issues in our corner of Gordon Head. All our neighbours are present. I look forward to hearing the stories about mega properties in Vancouver setting records. Not quite Gordon Head but 1752 Christmas Ave (single family witg legal suite) was listed for $699k sold for $718k and assessed at $517k!! Assessment values are way out of whack all over Saanich. Thankfully for my property taxes. I know I can probably sell my place for about 150k over assessment today. Hard to rely on assessed value alone without taking into consideration the value of upgrades and general condition of the house. I have a neighbor who sold his house for $300K above assessed value recently but then again he had put about $250K into updates over the past few years so it was probably worth it.